Сейчас идет снег в Mont Tremblant ?Thank you! Our Snow Report for Mont Tremblant brings daily updates on the snow conditions, snow depths, piste and offpiste conditions and the number of open ski lifts. The latest Mont Tremblant snow report shown below was updated on 24 Apr 2019. Snow Reports are provided regularly throughout the ski season courtesy of our own network of ski resort managers, the Skiclub of Great Britain and Skiresort Service International GmbH. In addition to the current report on ski conditions, we also provide webcams (including a 4 week cam archive), current live observations from nearby weather stations and also historical snow data for Mont Tremblant. Resort Ski Report:0 из 14 Открыто подъемников. Closed for Snow Sports. Our model predicted that 2cm (0.8 inches) of snow fell over 24 hours between Sunday 14 of April at 8PM and Monday 15 of April at 8PM EDT at the mid mountain level. Compacted depth will be less. *пользовательские наблюдения: только зарегистрированные пользователи могут отправлять их, и мы будем награждать регулярных и надежных авторов в конце сезона. Если бы вы хотели делиться своими наблюдениями, пожалуйста, свяжитесь с нами. Next 3 days weather forecast. 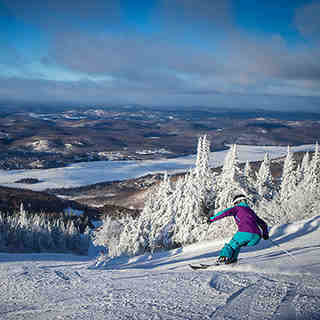 The snow report describes the piste and off-piste ski conditions at Mont Tremblant. You can submit an updated snow report here. Piste and off-piste are often different so we ask snow reporters to describe Mont Tremblant piste and off-piste conditions separately. If these details are missing from the Mont Tremblant snow report, you can predict off-piste conditions using the snow depth, the date of the most recent snowfall at Mont Tremblant, the Mont Tremblant weather report and the forecast. 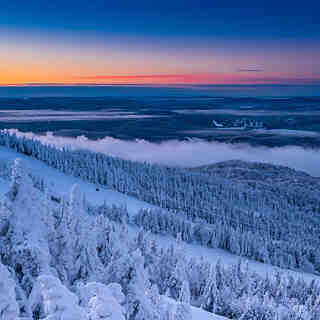 Members can check the hindcast for a timeline of Mont Tremblant weather conditions. This detailed weather log makes it easy to predict snow conditions at Mont Tremblant, even when the snow report is too old to be useful. The hindcast shows when our weather model last predicted snowfall at Mont Tremblant. It shows how much snow we think fell then, and the way freezing level, wind and weather have varied through time. You will be able to predict whether to expect off-piste powder, slush, spring snow, ice or wind crust. If you see a report of powder or fresh snow conditions several days after snow last fell, there is usually a good reason. At crowded ski resorts, off-piste new snow will be tracked out within hours of a fresh fall but wherever crowds are light in relation to the accessible terrain, it will be possible to stay fresh much later, perhaps several days later. Alternatively, strong winds sometimes redistribute powder snow enough to cover old tracks, or it may simply be that the ski area was not fully open for some period after the snow fell, so fresh snow that fell a while ago has remained un-tracked until this report. Whenever weather conditions change, Mont Tremblant snow conditions will change too, so it is important to check the time and date of the Mont Tremblant snow report and to guess what effect the weather will have had on snow quality between then and now. For example, the Mont Tremblant snow report on Friday afternoon may indicate fresh powder but if Friday night is mild and rainy then ski conditions will be very poor on Saturday morning. Conversely, if the weather stays stable and cold, the same snow report can be valid for more than a week. We advise that you check the Mont Tremblant snow forecast to see if conditions are likely to change before your visit. Many skiers enjoy moguls and fast icy pistes but for off-piste skiers and free-ride snowboarders, fresh snow starts to deteriorate from the moment it settles. Wind, rain and periods of above-freezing temperature are the primary cause of the evolution from fresh powder to windslab, ice or slush. High altitude slopes that are shaded from the sun and sheltered from the wind preserve powder stashes longer after fresh snowfall. If the snow report mentions pockets of powder at Mont Tremblant, study the Mont Tremblant piste map in relation to the wind direction to determine the most likely locations. We stress the importance of checking the date on the Mont Tremblant snow report particularly around weekends. For example, the snow report for Mont Tremblant on Friday may indicate powder after recent snowfall but following a sunny and busy weekend, when the locals hit the mountains en masse, the ski conditions (at any resort) can deteriorate rapidly and late arrivals may see very different ski conditions. Of course some people look for deteriorating conditions in the snow report for the likely development of mogul fields but for powder lovers and particularly snowboarders this can mean tracked out off-piste snow. Of course, this doesn’t always happen quickly after fresh snowfall particularly at quiet Север facing resorts at high altitude where genuine powder stashes may be found days or even weeks later. It is worth checking the piste map for Mont Tremblant (found in menu above) for the location of favourable slopes that may be described in the "Mont Tremblant Snow Conditions" part of the snow report. In addition to checking the Mont Tremblant snow report we recommend that you check the snow forecasts found in the menu at the top of the page along with our ski resort guide.